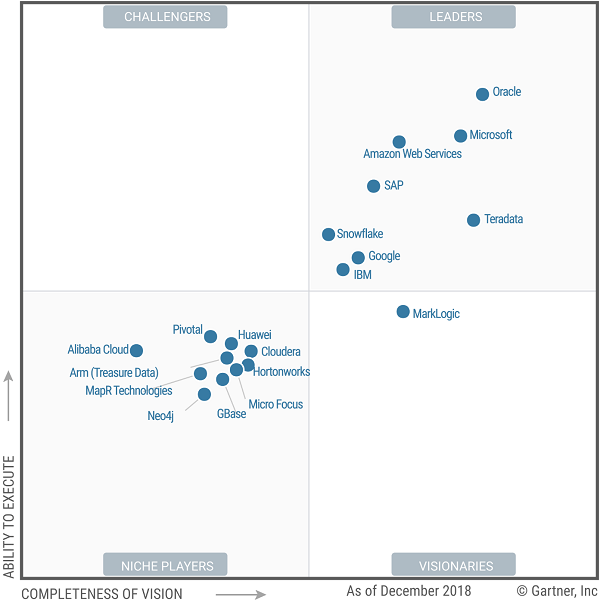 Gartner has, once again, recognized Microsoft as a Leader in the Magic Quadrant for Data Management Solutions for Analytics (DMSA) for 2019. “Gartner defines DMSA as a complete software system that supports and manages data in one or more file management systems (usually databases). DMSAs include specific optimizations to support analytical processing. The breadth and scope of associated roles and skills is also expanding as organizations engage with new use cases. These use cases include supporting ongoing traditional, operational, logical, and context-independent data warehousing." At Microsoft, we've championed a data platform evolution to make big data processing and analytics simpler and more accessible, helping you transform data into intelligent action. We do this through SQL Server 2017 and key Azure services such as Azure SQL Data Warehouse (a fully managed, Massively Parallel Processing, or MPP, cloud data warehouse) and Azure Databricks (an Apache Spark-based analytics platform). Start exploring our comprehensive portfolio of solutions for data warehousing, big data, and advanced analytics solutions. This graphic was published by Gartner, Inc. as part of a larger research document and should be evaluated in the context of the entire document. The Gartner document is available upon filling out the form.